When your on the go with two kids and one of them needs to eat or a it’s time for a diaper change its immensely important that I’m able to find the items I need from my diaper bag. It’s murphy’s law that the things I’m looking for will fall to the bottom of the bag and I’ll end up digging in what seems like a bottomless pit. That is until I discovered a new kind of diaper bag. PacaPod asked me to review one of their baby bags and boy am I glad! PacaPod baby bags are different than most diaper bags. They have plenty of separate storage spaces and what makes them so unique is the special “Pods” that it comes with. The Pods are specially designed for those items you need the most, bottles and diapers. The bottle pod can hold up to 3 bottles and keeps them insulated so that they stay fresh longer. The diaper pod has room for diapers, wipes and has a nifty (waterproof & wipe-able changing pad. Each of the pods stores in the front zipper so when it comes time to change a wet or poopy diaper or it’s time to nurse it’s all right there in the front ready to go, no more digging and panicking for me! The middle zipper area is perfect for changes of clothes. Having a baby with re-flux it’s very important to have multiple changes of clothes, burp clothes and bibs because in an instant her entire outfit could be soaked. Then there is another zipper area that is designed to hold all of mom’s (or dad’s) stuff like keys, a small wallet and any other little things you like to bring with you. This is now my favorite bag, if I have both girls it’s the only bag I bring because I don’t like carrying a purse along with a diaper bag so this is the perfect all-in-one organized solution. On top of helping me stay organized the PacaPod Napier Diaper Bag is super modern, fashionable and cute! The entire line is very modern and fashionable. It’s more like an oversized purse and doesn’t scream diaper bag at all, which I love. Buy It: Check out the full line of PacaPod Baby and Diaper Bags on the PacaPod website. Win It: PacaPod is generously offering one of my lucky readers a chance to win a Napier Baby Bag in the fabric of their choice! Enter here. 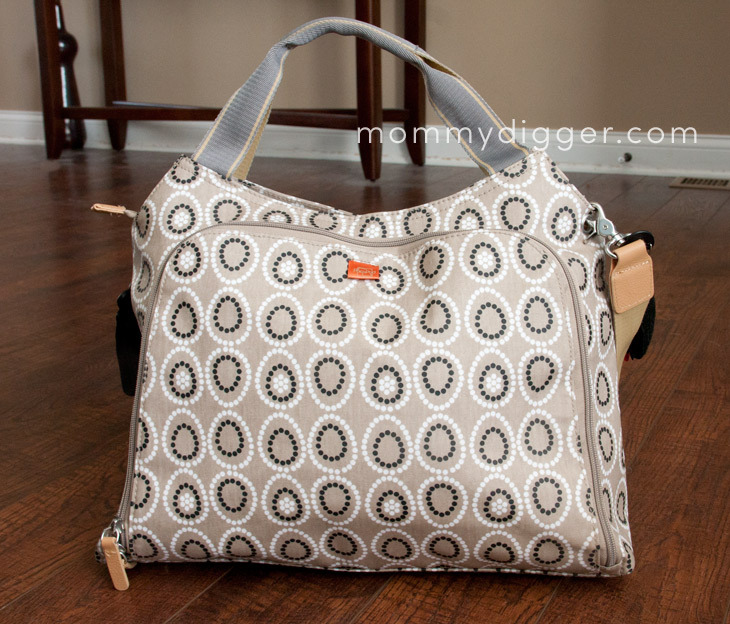 Ohh, what a great diaper bag – I LOVE it! Very nice bag, I’ve never heard of them but I’m going to check them out now!